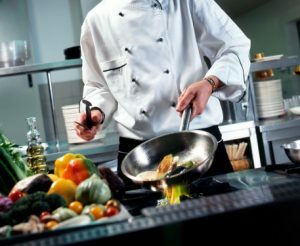 What Do Your Uniforms Say About Your Restaurant | Ace Uniform Services, Inc.
A restaurant staff’s uniforms are more important for a number of reasons. Are you a restaurant owner? If you are, did put careful thought and consideration into designing your employee uniforms? They have a huge reflection on your business. Customers will see your employee uniforms and make determinations about your restaurant. You do not want to allow them to be an afterthought because they can quickly drive customers away. Since this is the case, keep the following aspects in mind for designing and maintaining your staff’s uniforms. Dirty uniforms are incredibly off putting to customers. Nobody wants to be sitting at a table and have a waiter/waitress approach them while wearing a dirty uniform. If you want your customers to lose their appetite, that is an excellent way to do it. Ensure that all of your employee uniforms are routinely washed to remove any stains or bits of food that may be on them. You may even want to invest in a cleaning service that will wash your employee uniforms. How formal do you want your restaurant to be? This is a question you will need to ask yourself before you design your employee uniforms. If you want to be perceived as a high-end place, you surely do not want your staff to be wearing t-shirts and shorts. However, if you want to be a casual and family-type restaurant, you may want to consider designing your employee uniforms to be fun and playful. After you determine the formality of your restaurant, you then need to decide if you want your employees to have a modern or classic look in regards to their uniforms. For example, if you want your restaurant to stay current, you should look to your successful competitors. Take a good look at their clothes because it may help you come up with ideas. You may also want to turn to the internet and see what is currently trending in fashion these days. Also, you can rely on the expertise of a uniform rental service when trying to come up with the right uniforms for your restaurant. This entry was posted on Friday, August 18th, 2017	at 6:46 pm	. You can follow any responses to this entry through the RSS 2.0	feed. Both comments and pings are currently closed.